This trail will literally take you from one ocean to another; from one side of the peninsula to the other in the Cape Point Nature Reserve. It is relatively flat and there is no protection from the elements should it be windy or hot. Getting there: Park your car in a parking bay on the right-hand side of the road just inside the entrance to the Cape Point Nature Reserve. You may want to leave a second car at Olifantsbos to save you walking back. The trail heads up and over the Rooihoogte which is the low hill to the right of the road at the entrance to the Reserve. 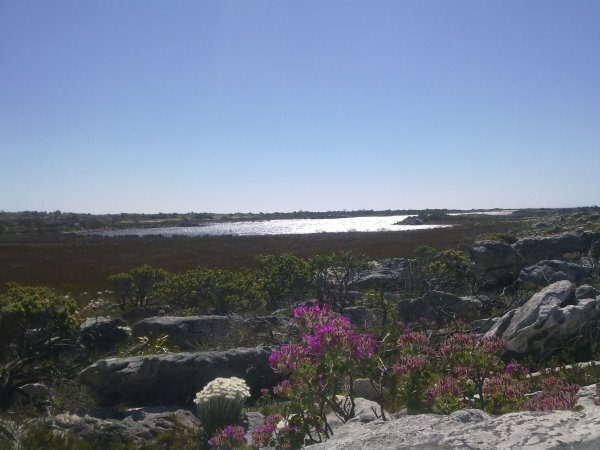 From the top of the hill it will take you will be able to see Sirkelsvlei in the near distanceand the path stretching across the plateau which you will cross to get there. The trail is fairly easy to follow as it winds over the small koppies. Please be careful of the wild bees as you ascend the last koppie and head for the road (on our recent trip the bees were not there and we guessed that they had moved off due to the prescribed burn of the area)! Cross the road and head off into the veld on the other side [-34.26422, 18.43471]. The trail is fairly easy to follow. Keep your eyes open in this area: both times I have walked this route I have seen a herd of Bontebok grazing in the near distance. Sirkelsvlei will be ahead of you, and you will approach it and pass it on the left-hand side. The water in the vlei is a dark, chocolate brown color. Apparently it is inhabited by Cape terrapins. Once you have passed Sirkelsvlei, you will head up a slight ridge. Once on top, you will be making your way down to the coastline at Olifantsbos. 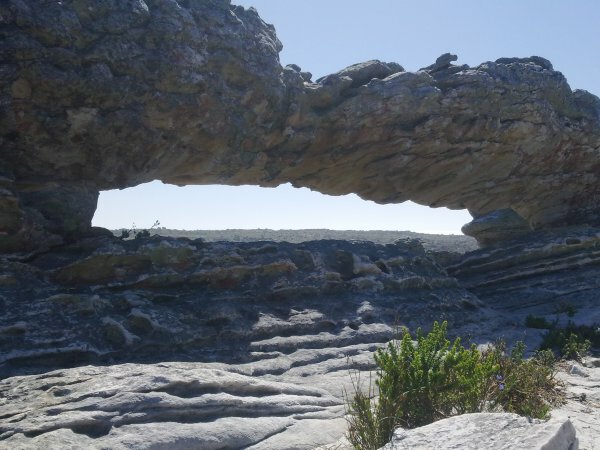 The surrounding area is fairly flat, with some unusual rock formations; about half-way between the vlei and the coast, you will pass Koggelman Arch. As you reach the coast, you will be walking along a ridge with a small valley called Die Kloof dropping away on your right. 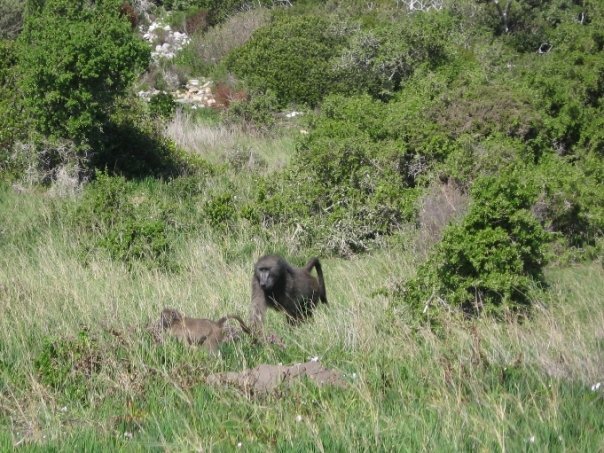 As I came down I came into close contact with a large troupe of baboons who were foraging along the beachfront. You need not walk down to the road at Olifantsbos, in fact as you come down the slope to the road, just after descending some wooden stairs, the trail splits and you should take the left-hand route.